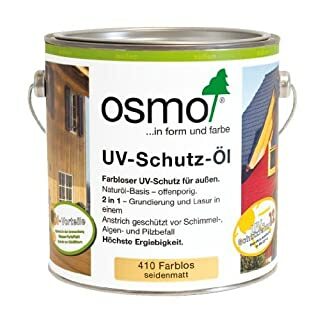 Osmo UV-Protection-Oil Extra is a Satin, clear finish for exterior. It is based on natural oils, is microporous, and does not crack, flake, peel or blister. 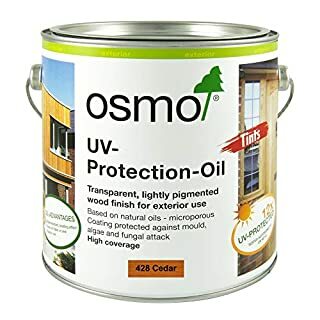 When used as a final finish after staining wood, Osmo UV-Protection-Oil Extra prolongs the renovation time significantly. 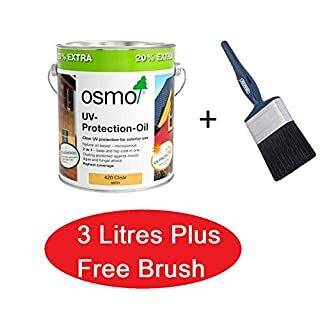 As a stand alone finish, with two coats, it prolongs the greying process on vertical surfaces by UV-Protection factor 12 compared to untreated wood. The finish contains active ingredients which protect it from mould, algae and fungal attack. Easy to renew, no sanding or primer necessary. Easy to apply, will not dry during application. All exterior woods grey into a patina colour over time, however UV-Protection Oil Tints have been developed to maintain the wood's natural colour with the use of pigments to optimally match the wood's natural characteristics. Ideal for windows, doors, cladding, fencing and other vertically structured joinery (not recommended for flat surfaces such as decking). Natural oil-based and microporous finish does not crack, flake, peel or blister. Water and dirt resistant, moisture regulating and reduces wood swelling and shrinkage. 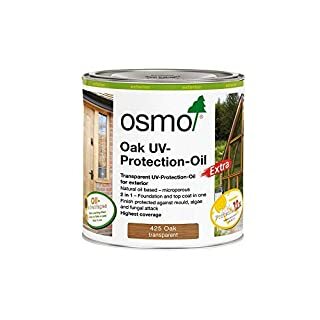 Osmo 425 Oak UV Protection Oil gives optimal protection from the sun, similar to Osmo 420 but it improves the UV resistance further by also having a small amount of Oak pigment. 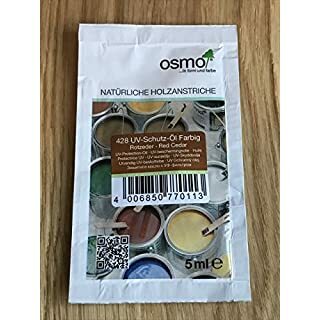 The oak pigment will darken the wood slightly and accentuate the wood grain but we recommend ALWAYS do a test before application, sample sachet available. For exterior use only. Especially recommended for vertical surfaces such as timber cladding, windows and doors Prolongs the renovation time significantly when used as a top coat for staining wood Contains active ingredients for the preventative protection against algae and fungal decay. Also available in 0.75 and samples sachets. 1 litre covers approx 16 square metres with 1 coat. Number of coats: 2 coats on raw wood, 1 coat for surface renewal - no sanding necessary. Osmo 428 Cedar UV-Protection-Oil Extra has a satin-matt finish and is for exterior use only. It is based on natural oils, is microporous, and does not crack, flake, peel or blister. 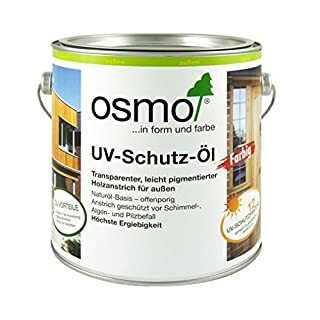 Osmo 428 contains a Cedar coloured pigment to further enhance UV resistance when compared to the clear Osmo 420. Please note this pigment will change the appearance of the wood and we strongly advise doing a small test area first. 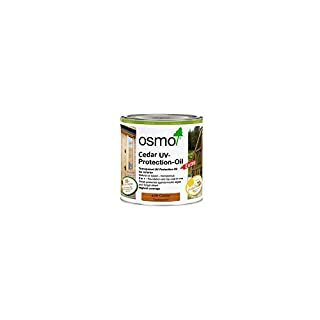 Osmo UV-Protection Oil Extra prolongs the renovation time significantly. The finish contains active ingredients which protect it from mildew, algae and fungal attack. Easy to renew, no sanding or primer necessary. Easy to apply, will not dry during application. 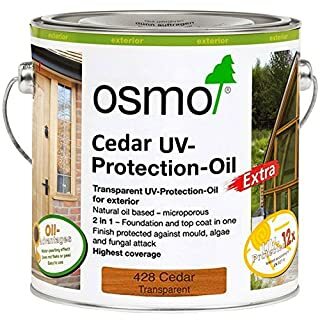 Osmo 428 UV-Protection Oil Extra Cedar is based on natural vegetable oils. Natural oils penetrate deeply into the wood, keeping it elastic and healthy, and preventing it from drying and becoming brittle. The wood is allowed to breathe. Moisture can evaporate. Shrinking and swelling are reduced. 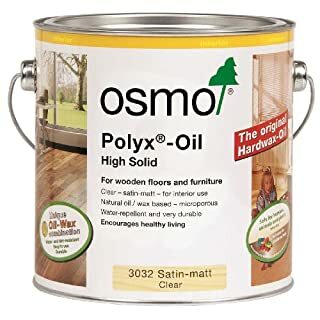 Recommended use: For all vertical exterior woods (dimensionally and non-dimensionally stable): doors, windows and window cills, carports, timber cladding, balcony, screens and fences, pergolas, garden houses and furniture.Ingredients: Based on natural vegetable oils this product fulfills. Preparation:Wood surface must be clean, dry and frost free (maximum moisture content 20 percent). 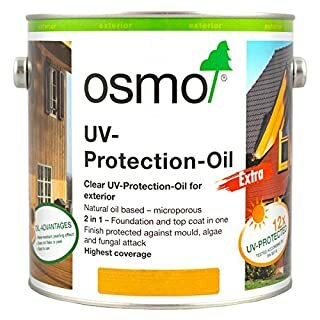 Osmo UV-Protection-Oil is ready to use, please do no thin, stir well before use. Clean old porous finishes thoroughly before renovation. Remove any non-porous coatings. Please do not sand even surfaces finer than P120. Do not apply below 5C or when the temperature will drop below 5C before the drying is complete. 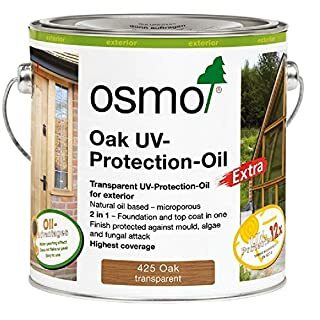 Osmo Oak UV-Protection-Oil Extra is a satin-matt finish for exterior. It is based on natural oils, is microporous, and does not crack, flake, peel or blister. 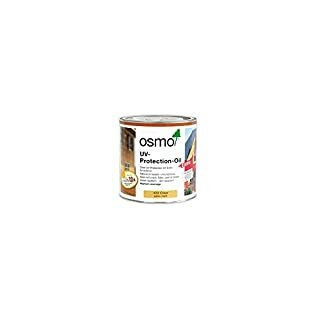 When used as a final finish after staining wood, Osmo UV-Protection-Oil Extra prolongs the renovation time significantly. As a stand alone finish, with two coats, it prolongs the greying process on vertical surfaces by UV-Protection factor 12 in comparison to untreated wood. The finish contains active ingredients which protect it from mould, algae and fungal attack. Easy to renew, no sanding or primer necessary. Easy to apply, will not dry during application. 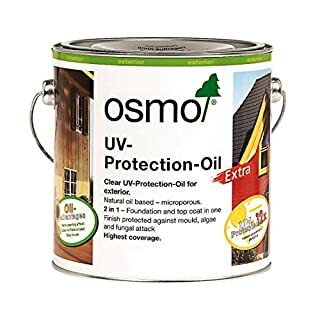 Osmo UV-Protection-Oil Extra is based on natural vegetable oils. Natural oils penetrate deeply into the wood, keeping it elastic and healthy, and preventing it from drying and becoming brittle. The wood is allowed to breathe. Moisture can evaporate. Shrinking and swelling are reduced. 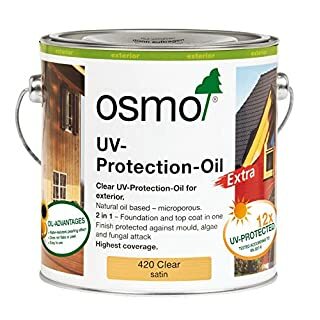 Osmo 428 Cedar UV-Protection Oil Extra is a satin-matt finish for exterior use only. It is based on natural oils, is microporous, and does not crack, flake, peel or blister. This product contains a Cedar pigment which will effect the appearance of the wood so we recommend always doing a test area first. 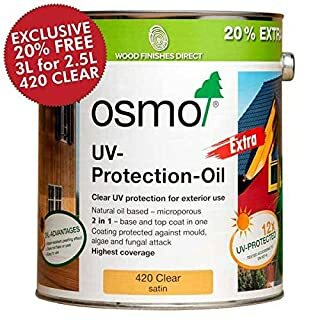 Because it contains a coloured pigment it will offer significantly better UV protection than the clear Osmo 420. The finish contains active ingredients which protect it from mildew, algae and fungal attack. Easy to renew, no sanding or primer necessary. Easy to apply, will not dry during application. 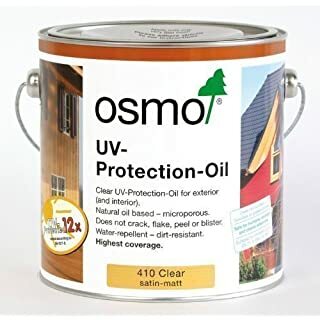 Osmo 428 UV-Protection Oil Extra is based on natural vegetable oils. Natural oils penetrate deeply into the wood, keeping it elastic and healthy, and preventing it from drying and becoming brittle. The wood is allowed to breathe. Moisture can evaporate. Shrinking and swelling are reduced.Recommended use:For all vertical exterior woods (dimensionally and non-dimensionally stable): doors, windows and window sills, carports, timber cladding, balcony, screens and fences, pergolas, garden houses and furniture.Ingredients: Preparation: Wood surface must be clean, dry and frost-free (maximum moisture content 20 percent). 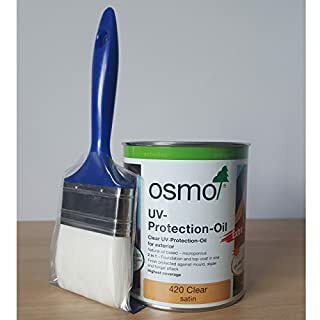 Osmo UV-Protection-Oil is ready to use, please do no thin, stir well before use. Clean old open-porous finishes thoroughly. Remove any old non porous finish such as varnish. Please do not sand surfaces finer than P120. CEDAR TINTED UV PROTECTIVE FINISH. All exterior woods grey into a patina colour over time, however UV-Protection Oil Tints have been developed to maintain the wood's natural colour with the use of pigments to optimally match the wood's natural characteristics. Ideal for windows, doors, cladding, fencing and other vertically structured joinery (NOT RECOMMENDED FOR FLAT SURFACES SUCH AS DECKING). Natural oil-based and micro-porous finish does not crack, flake, peel or blister. Water and dirt resistant, moisture regulating and reduces wood swelling and shrinkage. For interior use only: Ideal for all wooden floors, solid or plank wood, strip parquet, OSB or cork flooring. Highly recommended for wooden furniture. Also for slate and screed as well as terracotta and other natural (non-glazed) ceramic tiles. Advice For exotic wood species use Wood Wax Finish Extra Thin. Some woods are highly porous and requires an especially thin application, as a result the drying can be increased. Over application and/or low ventilation can also increase the drying times. All exterior woods grey into a patina colour over time, however UV-Protection Oil Tints have been developed to maintain the wood's natural colour with the use of pigments to optimally match the wood's natural characteristics. 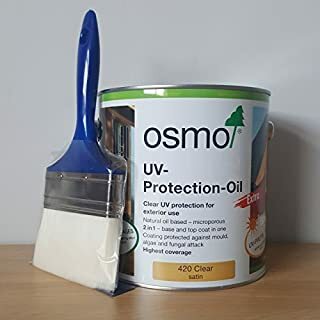 This 125ml pot of Osmo UV Protection Oil Tints in 429 Natural is for colour testing, repairs & small jobs, the product is Ideal for windows, doors, cladding, fencing and other vertically structured joinery (not recommended for flat surfaces such as decking or surfaces with less than a 15 degree fall off). Please note the 429 Natural contains a small amount of white pigment, designed to offset the normal darkening and yellowing effect of oils so should only be used on pale European woods and a test on an inconspicuous area should always be done first.